Spring brought an invasion of ants into my kitchen and other areas in my home. The technician (Ricardo) who sprayed the interior and exterior of my home was courteous, thorough, careful and knowledgeable. I recommend Smithereen! We had our first visit and were very pleased. We just had our second visit and are very pleased again. Ricardo M. was our technician both times and we found him to be very thorough, knowledgeable and courteous. Mark is amazing. We had some miscommunication about which properties were suppose to be serviced but that was resolved. We were having problems with tiny ants, Ricardo came out the first time and was here an hour and couldn’t find anything( nest, ants because we sprayed from a bottle) when they reappeared a week later he came right out and went thru the whole house, we didn’t see anything but he came back a week later for a follow up and we’re going on 3 weeks, let’s keep our fingers crossed🤞, he was very professional and very informative, I would definitely recommend this company to my family and friends. James was very nice and polite, with a smile on his face. Our technician Jay is friendly, accommodating, and extremely conscious of our needs. We could not be happier with the service we receive from him. Ben is the best technician. Thank you Smithereen for doing a great job! as always, quick response time, fair prices and excellent service. Can't ask for more. Smithereen will always be my first choice. Lenny is awesome, he explains what's happening, gives us next steps on things we should be doing, and slowly but surely, there are less and less mice in our house! The service man U sent was WONDERFUL - responsive and knowledgable and helpful VERY HAPPY with the service. We had Tony at our house to help us take care of a couple mice that found their way into our house. He was extremely knowledgeable, found where the mice were entering our home and answered all of my questions. Tony came back to our house a couple more times for follow-up & to reset the bait and fill the hole and we couldn't be happier! Tony is fantastic and Smithereen is lucky to have him. The tech does a fine job, no news good news. 3950 N Lake Shore Condo Assoc. Mark, our technician, does a great job in addressing our needs. Mark goes above and beyond and he addresses the resident concerns. 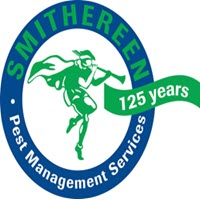 Smithereen's upper management has also taken care of our needs whenever there are questions or concerns. The service has been very good...the technicians are very knowledgeable. The billing process, however, is becoming a nightmare. Lenny is knowledgeable and thorough. That's why I'm satisfied with Smithereen. It's all about the technician! Punctual. Very responsive to calls & e-mails. Very knowledgeable. Attention to the various needs of the customer are well demonstrated! Professional service. Timely and knowledgeable. Took time to explain and answer questions. Accommodating with scheduling. Effective, prompt, and professional service. Thank you! You were very helpful! The man who came to our home today to spray was very nice and also very thorough. I give him a high rating. Great service. Easy to schedule. And they are doing the very best to get rid of our problem areas. Thank you! Very happy with this company. You call them for service and the job gets done no need to go anywhere else. What there doing works. One and done! I love it. Just had tech, David Newell, provide services for an ant problem. He was fantastic. Pleasant, informative, and listened to my concerns and answered all my questions. He"s a great representative for your company. I will certainly recommend Smithereen to others and, as needed, Use your company again. Lenny is doing a great job servicing our office building. He shows up on the day and times as scheduled. He's prepared and know's the routine. We don't need to take our time show him around the building each time because he knows where and what's expected. Lenny asks if there are any new pest issues, and he inquires about the previous solutions he's used, and checks how those are working. He's fast, thorough and friendly. Looking to hire you at another apt. building we manage; 721-725 Austin St. Evanston, IL 60202. Please have someone contact me, asap. Riccardo the service tech is terrific!!! Attentive, Prompt, and Friendly service. Also--Problem taken care of. I had a significant Skunk problem (8 skunks) living under our front porch which not only stunk up the whole house, but also brought fleas. I used a service out of Schaumburg, which did an okay job, but they were very passive and after a month and a half had little success. I then called Smithereen, which responded the same day with a great Tech, Charzjon, who came out to our house and went under the porch and fixed the problem. After 2 more visits all the skunks were gone. He then installed a fence which, so far, has kept the skunks at bay. Although the fence is expensive and the installation took a few weeks to complete due to Charzjon's busy schedule, it appears to be successful and our house is smelling normal once again. Thanks!